Tie a winning imitation of the hexagenia nymph and other monster bugs using ordinary tying skills and common materials. MANY NYMPH PATTERNS IMITATE A WIDE SPECTRUM OF AQUATIC FOODS rather than the larval stages of specific insects. This fly, however, imitates the final nymph stage of the largest burrowing mayflies: Ephemera guttulata (green drake), Ephemera simulans (brown drake), and the European relatives Ephemera danica and vulgate. These beefy nymphs prefer living in soft organic, or sandy and muddy bottoms. They can live there, more or less buried, for up to several years, appearing only occasionally to feed on decomposing plant matter. They have been known to burrow as far as 50 feet deep into the bottom! These large insects range from 12 to 32 millimeters long. They are easily recognized by the breathing gills along the sides of their abdomens, and they have oversized forelegs for burrowing. In addition to breathing, the gills function as a ventilation system for their tunnels. Their gills keep water flowing through the tunnels, which in turn keeps them open. If a nymph leaves its burrow or stops the undulating movement of its gills, the tunnel will collapse. For most of their lives, these unique nymphs are unavailable to the trout. When the time is right, however, they leave the safety of their burrows and swim quickly to the surface with an undulating body motion. The trout can feed on the ascending nymphs for several hours before turning their attention to the winged duns. During those periods, using a matching nymph imitation can mean the difference between enjoying fast fishing or having no sport at all. Hook: Mustad R73-9671 or an extra-long nymph hook, sizes 12 to 8. Abdomen: Olive brown Antron dubbing. Thorax: Olive brown Antron dubbing. Wing case: Floss or Antron body wool. Legs: Olive cul de canard. Note: Brown, tan, and gray versions also work well. Our fly will imitate a large nymph, so we must choose a hook that will reflect the length of the body. A 3X- or 4X-long heavy-wire hook, in sizes 12 to 8, will work well. Wrapping nontoxic wire on the hook in the area of the thorax will enhance the undulating swimming action of the fly. The dubbing used for the abdomen and the thorax should absorb water; water-repellent dry fly dubbing is a poor choice. I am using ordinary Antron dubbing in the tying photographs. Ostrich-herl gills and cul de canard legs make the pattern look alive when stripped through the water. And I use UV-treated dubbing and ostrich herl; although I have not had obvious improved results using these enhanced materials on my freshwater patterns—I have had noticeable success using UV-treated ingredients on my saltwater flies—they do no harm and might even give me an extra edge. I previously used golden pheasant tail fibers for the wing case, but I have substituted more durable Antron body wool. The Burrowing Mayfly Nymph is a good-looking fly, and when the conditions are right, the trout love it. 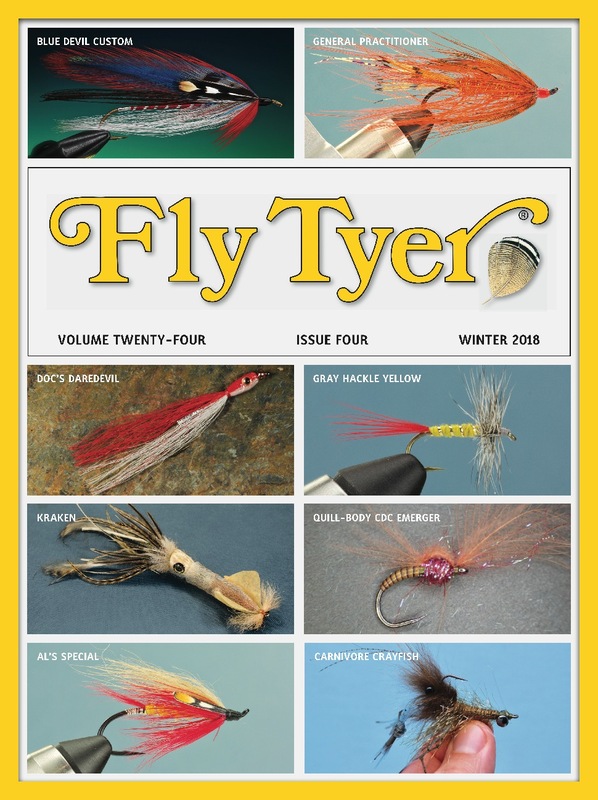 It requires little more than basic tying skills, and you will find all the materials at any fly shop. Barry Clarke is a regular contributor to this magazine. We discovered Barry, who lives in Norway, through his great blog, www.thefeatherbender.com. It’s full of excellent patterns, tying instructions, and much more. Check it out!